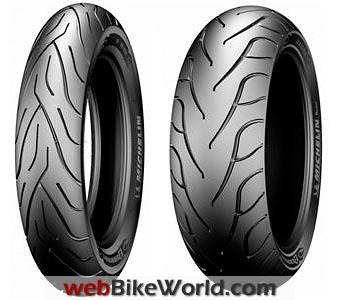 January 1, 2012 – Michelin Motorcycle Tires launches the Michelin Commander II tire today. The Commander II is available immediately in 15 sizes, in both bias and radial construction. Michelin says that the Commander II tire offers “a new standard in cruiser tire longevity and uncompromised handling and stability”. Tire life is one of the most important issues for cruiser tires, especially the rear tire. Michelin said that their chemical engineers and tire engineers have developed a new rubber compound without aromatic oils to meet the long mileage demands of cruiser consumers. Third-party tests indicate that the Michelin Commander II rear tire lasts almost twice as long as its main competitors. The tests were conducted by the Texas Test Fleet in 2011 on public roads and compared the Michelin Commander II to the Metzeler ME880 and the Dunlop D407/D408, in sizes 130/80 B 17 (front) and 180/65 B 16 (rear). Note that individual results may vary depending on motorcycle type and operating conditions. The new tire compound used in the Commander II also helps achieve “remarkable wet grip performance without compromising mileage”, according to Michelin. The Commander II also features a rigid, high-density carcass architecture, called “Amplified Density Technology” (ADT), which allows for exceptional maneuverability and feedback to the rider. An aramid fiber applied to the crown ply of the rear tire allows a lower weight while providing stability at high speeds by resisting growth. The Commander II tire also utilizes a square-bead sidewall, which is claimed to provide additional stability and provides easier installation. 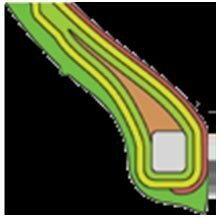 Michelin says that impressive water dispersal characteristics are provided by longitudinal grooves in the tire tread pattern, enhancing grip in wet conditions. All of these features, including the stylish sidewall and tread pattern, resulted in the Commander II tire debuting as original-equipment on the new Indian Chief Blackhawk Motorcycle. “The Commander II tire raises the bar for what consumers can expect from a Cruiser tire, with unmatched longevity as well as style and stability” said Gary Midkiff, Vice President of Sales and Marketing for Michelin North America’s two wheel division. Silica Rain Technology (SRT): Featured on Michelin Commander II radial tires, SRT integrates silica into the tire’s tread compound to improve grip in cooler temperatures and on wet pavement, without compromising tread life. 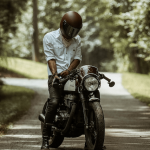 Michelin was a pioneer in introducing silica into passenger car tires and continues that trend in the motorcycle realm. For the majority of Commander II tires, which are bias-ply, new tread compounds were developed to echo the characteristics of the SRT-infused radial, with emphasis on tire longevity and wet-weather handling. 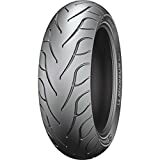 New Tread Pattern Design: The tread pattern on the Michelin Commander II tire was influenced by the style of cruiser motorcycles as well as the popular Pilot Road series of tires with a “flame effect” design. Longitudinal grooves in the tread pattern evacuate water to enhance grip in wet conditions and the tread pattern has been optimized with computer design to maximize mileage. Conventional ply on the left and the Michelin Commander II 90-thread ply on the right. Amplified Density Technology (ADT): ADT is a rigid, high-density carcass architecture which allows for enhanced maneuverability and feedback to the rider, especially during cornering. The difference between conventional 71-thread ply tires and the Michelin Commander II tire’s 90 thread ply (photo above) illustrates the increased density of the new tire versus competitors. Aramid Fiber: All Michelin Commander II rear tires, except the narrowest sizes (80/90-21 and 100/90 B19), integrate Aramid fiber into their construction. Aramid is applied to the crown ply of the tire to allow for low weight and increased casing rigidity while providing stability at high speeds by resisting growth. Square Bead Sidewall: The unique sidewall of the new Michelin Commander II tire features square bead wires in the tire bead. These wires improve bead strength and casing rigidity, which enhances handling. Additionally, the square bead wires provide ease of installation by improving the primary air seal when mounting and inflating.